Our number one promise to the electorate for the 2010 Local Elections was the scrapping of the unpopular £25 charge for bulky item collection for residents which the Lib Dems have attempted to delay the implementation of. Despite this, we are still hoping to have the service available for Brent residents from 1st October 2010. But we’ve decided to go further than our pledge to scrap the £25 charge. Part of our vision in the build up to the Local Election was to make Brent a greener Borough. We are now paving the stones to fulfill that vision, as Brent under Labour is setting an example that we hope that other Local Authorities will be adopting. Our overhaul of rubbish and recycling collection is part of the wider Waste Strategy, which at the heart of it aims to more than double the recycling rate of the Borough from what is is now at 28% to 60%. Under our proposals, landfill waste will be collected every two weeks and recycle and compostable waste every week. The weekly green bin waste collection service will be extended to 28,000 properties who currently have no such provision. According to a report Undertaken as part of the Council’s Improvement and Efficiency Programme, the change in policy will result in efficiency savings in excess of £1 million due to less money going towards landfill tax. Basically as it stands at the moment, we are paying to put our rubbish into a big hole in the ground. 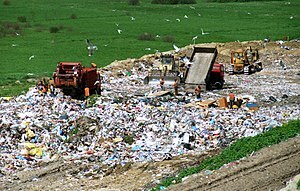 WE NEED TO END OUR RELIANCE ON LANDFILL. In addition, we have a statutory obligation to achieve a recycling rate of 40% by 2011. Under the current system, this target will not be met. Yes, there are concerns that if people do not adjust their behavior and change their habits to recycle more that the recycling rates that we are aiming to achieve may not be realised. But the same concerns existed when Brent first introduced kerbside recycling and after an initial lag in changing behavior as people transit to become used to a new scheme, it is now relatively successful. If we keep faith that everyone will cooperate to make this revolutionary scheme work, we can make a difference and set an example for Local Authorities around the country to follow. Posted on August 29, 2010 August 14, 2017 by Cllr Krupesh HiraniPosted in GeneralTagged brent council, Brent Lib Dems, Brent Liberal Democrats, environment, Landfill, london borough of brent, Recycling, waste, Waste collection, Waste management, Waste Strategy.